The live final will be held at Minami-Aoyama Future SEVEN on April 30th. 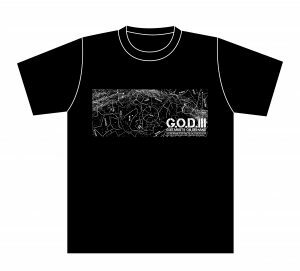 Choose one song from ” G.O.D.”, “G.O.D.II”, “G.O.D.111”, “G.O.D.LIKE COMPOSER PACK” or “G.O.D.III” and record a playthrough video. Upload it on YouTube or Twitter. Advertise it on Twitter. The tweet must include ”the URL of the video (if you chose YouTube)”, ”#play_like_godIII” and ”@GtOnDemand”. If you don’t have a Twitter account, send an e-mail here with your name and URL of the video. That’s all! Please wait for your entry to appear on our entries page. G.O.D. members will choose the 4 best entries, and the entrant who gets the most Retweets by April 17th will also go through to the live final. Support your favorite guitarists to help them be the finalists! You can enter with a video which is already public on the internet. You cannot enter with a video which you used to enter previous G.O.D. events. We’ll accept entries from all over the world, and we’ll ship the prize worldwide. You can play with any kind of tracks including the original version, the distributed backing tracks and of course, the backing tracks you create on your own. You cannot enter with a video that contains any copyright infringement.